Important updates for Dublin High School parents from the Dublin High PFSO. Prior updates available here. 9/15 Back to School Night for Parents 6:30p.m. 9/29 Tri-Valley College Fair at Foothill High School 6:30-8:30p.m. As new president of the PFSO, I just wanted to say Thank You for so many of our successes in the last few months. Thank you to all who volunteered to work at registration. Your help was absolutely crucial to getting our school year off to a great start. And last by not least, thank you to all who made donations to the PFSO and to your class accounts. Last spring, the PFSO board voted on a new funding model that will allow us to contribute more to filling campus needs. We have implemented a line-item budget that provides funds to every department and we hope to have a bigger role in closing budget gaps as the year goes on. Our ability to do that is directly related to your generosity. If you are new to Dublin High, we want to let you know about a great new opportunity to get the lay of Gael-land! We will present Dublin High 101 before our regular PFSO meeting on Monday, Sept. 26. We will begin at 6:30 p.m. in the library and we would love to see you there! It’s our goal to give you great information about the parent groups that provide such important support on our campus. Tickets can also be purchased on Fridays at lunch where the movie tickets are sold (in front of Student Activities). Also look for a convenient online payment option coming soon. For questions, please email dhsfundraising@yahoo.com. You can also contact Yvonne 828-7060 or Stacey 833-0884. Tables are reserved in groups of 10, so get a group of friends together and purchase your table now! You can also sponsor a staff member by purchasing a ticket for them! Come join a fun evening and help support our kids and our school at the same time! Please mark your calendars! The Dublin School Board of Trustees has called a special meeting on Wednesday, Sept. 7 at 6:30 p.m. in the DHS Library to take public input on the resubmission of the Tassajara Prep Charter Petition. If you are interested in speaking on the issue of a charter high school in Dublin, you should plan to attend the meeting. As representatives of your PFSO, we will be there and we would like to see a large gathering in support of Dublin High School on this evening. You can speak or you can listen. But let’s support Dublin High as a community! The Board of Trustees will not be making a decision on the petition at this meeting, but this is a required public hearing as part of the charter process. DUBLIN HIGH HOMECOMING IS RIGHT AROUND THE CORNER! The theme for this year’s homecoming activities is Decades. Classes have been choosing their favorite Decade and will be busy making the most of their themes for all the homecoming events. The homecoming parade, carnival, and football game will take place on Friday, October 7th. The homecoming dance will be the next day, Saturday, October 8th. Please mark your calendars for the Parent’s Back to School night on Thursday, September 15 at 6:30p.m. Meet your student’s teachers and keep informed. least $500 to help purchase much needed supplies and materials to better instruct our children. All the profits from Raise Your Class go toward this PFSO cause as well as contributing money to each current class at DHS to support their Safe and Sober Grad Night event. You can also sponsor our event with a monetary contribution in exchange for advertising. We would be happy to send or email our sponsor-level packages. If you can help in any of the above mentioned ways, please email DHSfundraising@yahoo.com. 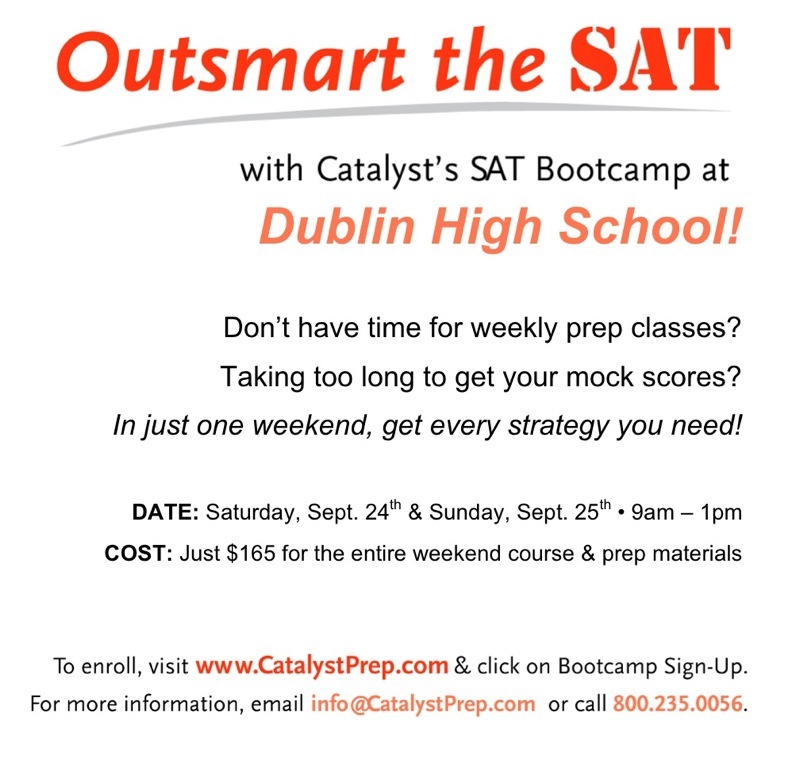 Dublin High will be holding a practice SAT test for students on Saturday, September 17th from 9am-1pm. The cost is $15. For more information, please see Mrs. Halket in the Counseling Office or email halketkim@dublin.k12.ca.us. California Scholarship Federation Applications are now available in the Counseling Office. The Deadline to turn them in is September 30. Your student can sign up for the PSAT now through October 10, 2011. The test day is October 15 at 8:00 am. Payments will only be taken in the student activities center during lunch and after school. The cost for the PSAT is $28.00. If you need a fee waiver; sign up to see your counselor in the counseling department. Payments can be made by check or cash. Checks need to be made out to DHS. Sign ups are on a first-come basis. Space is limited to 350 seats so please hurry. Use MY College QuickStart to access free resources and information about college and career planning. The Freshmen Class of 2015 has launched a Facebook Page to get out info about their class activities throughout the year. Please mark your calendars for Parent’s Night with the counselors. Junior and Senior Parents meet on 9/28 at 6:30p.m. in the Little Theatre. Students are welcome. The counselors will go over subjects related to the two grade levels including: important calendar dates, SAT/ACT information, college applications, and more. They will also review updates from the CSU and UC systems regarding impaction and college admission. It will be very worthwhile to come to these nights but in case you are unable, the counseling department will be posting their power point presentations on the website. Regal movie tickets will be on sale every Friday in front of Student Activities. Ticket prices are $7.50 per ticket for non- pass restricted movies. 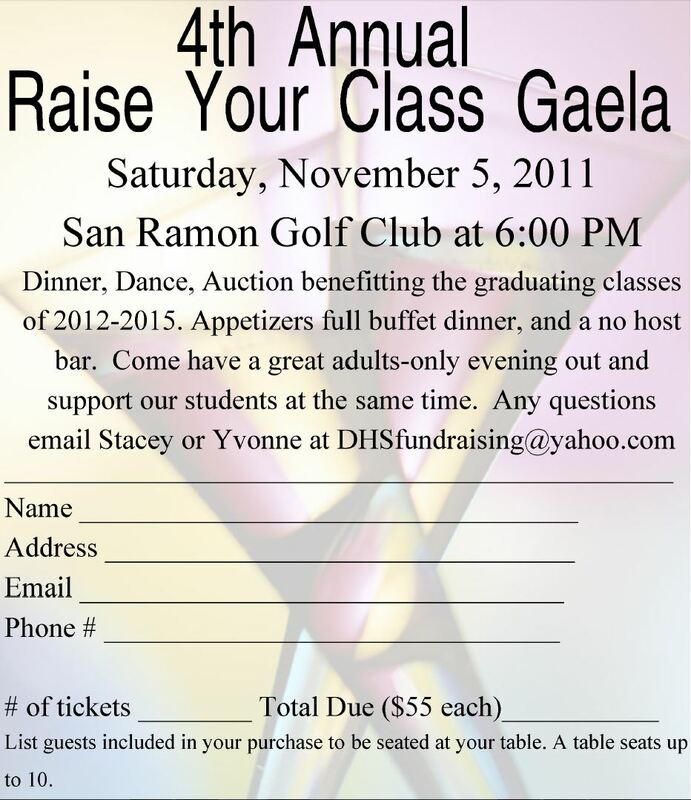 This fundraiser benefits the Class of 2014.